I enrolled in the AoC because of my work; I thought it would be a useful resource for organizing meetings. Little did I know that this would be a transformative and empowering journey, that would not only change the way I participate in meetings, but also (and perhaps mainly) the way I connect with people. The AoC gave me an easy-to follow, yet powerful structure to organize gatherings that have a clear purpose and generate authentic engagement. It replaced my fear of leading with the capacity to convene in a way that allows for wisdom to flourish and changes to be generated. But more than that, the Art of Convening gave me the confidence, motivation and inspiration I needed to start creating a new way of leading people towards growth and positive change. CPL helped me use the Art of Convening to plan an important series of meetings that were much more successful as a result. I received feedback from participants that these meetings were among the most effective they’d ever experienced, and it was clear to me that they resulted in productive outcomes and very positive energy. The Art of Convening works, and CPL is a valuable partner! Wow! What an awesome experience this has been with a truly wonderful international cohort of learners. My word was GENEROSITY…it rose up through the generosity of spirit present amongst everyone in the group. I am forever grateful for this gift that will, no doubt, keep on giving. Thank you! Thank you! Thank you! It has been a privilege and a joy! Thanks for such an eye opening, well-done training. Using the Convening Wheel tool was a huge aha for me. It helped me to realize there were steps I was missing in convening meetings. I have already used this in meetings I have facilitated with very positive outcomes. The Art of Convening Training has been a very rich experience. I walked away with so much insight and confidence in planning future meetings. I knew when I have convened meetings in the past that something didn't work, but could never really put my finger on it. This training really helped me to identify that there were important steps that I was missing along the way. I’m looking forward to put these new tools and skills into action. The Art of Convening has had a truly positive impact on my both professional and personal life. It has helped me get clear on my own values and intents, and as a result, to engage in more authentic and impactful conversations with others. I’ve experienced a new and improved depth in my relationships, and as a result, significantly improved collaboration and outcomes. I use convening principles with much success, in settings ranging to 1:1 conversations, to audiences of several hundred. 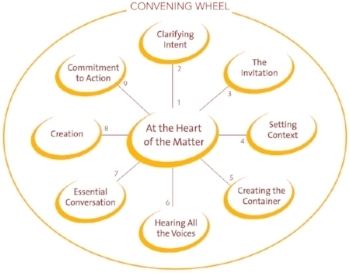 As a matter of fact, using the convening wheel has become a habit. The quality of our relationships is the organizing principle behind so many outcomes, both personal and professional. Thanks to this practice, I am experiencing more rewarding and positive outcomes in both spheres. I’ve just started the process of engaging my entire team in learning this practice and I am already seeing the results in our workplace. Culture is how people express and define themselves within an organization. Engaged, purposeful people create thriving cultures leading to greater success and higher ROI. Focusing on purpose creates a conversation about intention, engagement and ultimately alignment of culture. I’m finding myself imagining gatherings in a new way, with more satisfying connections and fruitful outcomes. I’ve gotten so much from the Virtual course. I love how you’ve put together all the tools to make a really meaningful experience. Designing my own on line class as a case study was a great real time learning opportunity – thank you!